A youth music education organization primarily focused on preserving and promoting the Canadian heritage and art of folk fiddling. We develop leadership, confidence, discipline and time management, and expose youth ages 7-18 with local, provincial, national and international performance experiences. The room is cold and somehow feels empty. It’s almost Christmas. Shouldn’t there be lights and trees and Rudolph music here? The 4 year old boy’s head hurts and the words he hears from the big people in the room are jumbled and too big for him to understand. Why does it hurt so much, and why is he feeling confused all the time. To fill the dullness of this place his mind begins to wander to a recurring day-dream that he is playing a little violin just like the lady, a few months before, at the CPO’s Saturday Morning at the Symphony. The beautiful music in his mind engulfs him briefly bringing him instant comfort. Josh is suddenly interrupted and fear returns as he looks to see his crying mother’s face. He knows something is wrong, but it will be many years before he understands that this moment has changed his life forever. That fateful day, Josh is diagnosed with neurofibramatosis. The petit and grand mal seizures intensify and the intensive care unit becomes his home over the Christmas holidays. Feeling sorry for Josh that he will not be with his brothers and sisters on Christmas morning, his neurologist asks him what one thing he wishes for most. On Christmas morning with his eyes as big as saucers, he excitedly opens the special gift from his doctor. It’s a tiny 1/8 size violin! The months and years pass and Josh learns to live with cognitive decline and impairments to his speech, language processing and increasing forgetfulnenss. Without the successes he experiences with the violin, his parents envision a decline in his spirit. Miraculously, his neurological deficits are not affecting his ability to play his violin. In fact, his music ability continues to improve and becomes the driving force and constant in his life. It is the one thing he knows he is improving at and enjoying. At the age of 7, Josh’s musical dreams get even bigger when he announces to his parents “one day I want to be a Calgary Fiddler”. The fiddle performance he attends with his violin teacher stirs an emotion within him of determination and drive. He is dreaming big, but he knows that with practice and hard work he can do it. And do it, he does! At the age of 14 while still experiencing seizures on a daily basis, Josh aces his audition for the Calgary Fiddlers and embarks on a 4-year journey of the most active and fulfilling musical years of his young life. Josh credits music and fiddling, in particular, to his emotional and physical healing. Not only did performing and learning to fiddle (and mandolin) build his self-confidence, his leadership skills developed as he mentored new fiddlers to the group each year. Now, as a recent graduate of the Calgary Fiddlers program, Josh has joined a folk/indy music band and plans to go to college for music production. The Calgary Fiddlers Association fiddle music education programs create amazing young people who gain so much from seeing first-hand how their music affects others, both emotionally and spiritually. The Calgary Fiddlers Association is a non-profit, charitable organization celebrating its 35th Anniversity during 2017. CFA Mandate: To preserve, promote and perform all types of fiddling, with a particular emphasis on Canadian styles. Fiddling is an old art which emerged in 10th century Europe and has traditionally been passed down from generation to generation. This folk music has played an important and integral part in the cultural fabric of many nations, as well as Canada. For a time (not so long ago), there was an inherent risk the fiddle tradition was dying out. Our aim is to provide as many opportunities as possible for youth to continue the tradition of fiddling, or to be exposed to it, within Calgary and area. CFA Mission: Through the art of Canadian fiddle music, we motivate, educate, and inspire children to develop musically and socially. Why? The Calgary Fiddlers Association emerged from the classical violin program at Mount Royal Conservatory of Music in 1981. At that time, Dr. Norman Burgess was the Director of the Conservatory and his passion for innovation, creativity and excellence led him to create the Calgary Fiddlers program for young classically trained musicians. He loved classical violin and he LOVED to fiddle (his two worlds collided to create something VERY special). 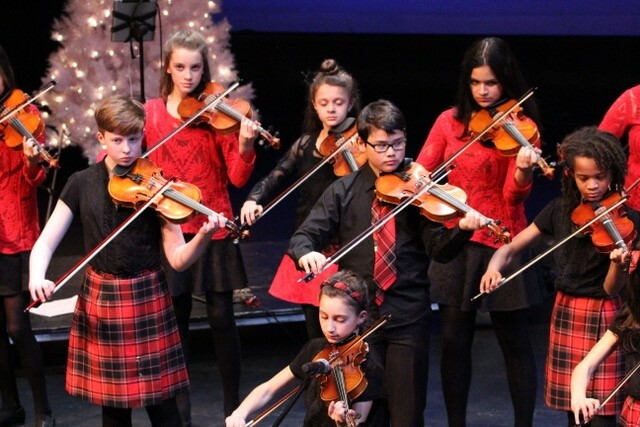 Our very unique programs motivate, educate and inspire classically trained youth to embrace classically-inspired fiddle music while making life-long friends. CFA Vision: To develop life skills in our young students such as leadership, confidence, discipline, and time management, and an appreciation for the Canadian heritage of folk fiddling; all acquired with exposure to local and international performance experiences, while promoting and preserving the art of fiddle music. Why? In addition to providing a rich musical education setting, the Association provides over 100 performance opportunities each year to young students. Performing allows our youth to develop essential skills that help them become amazing citizens within their community. 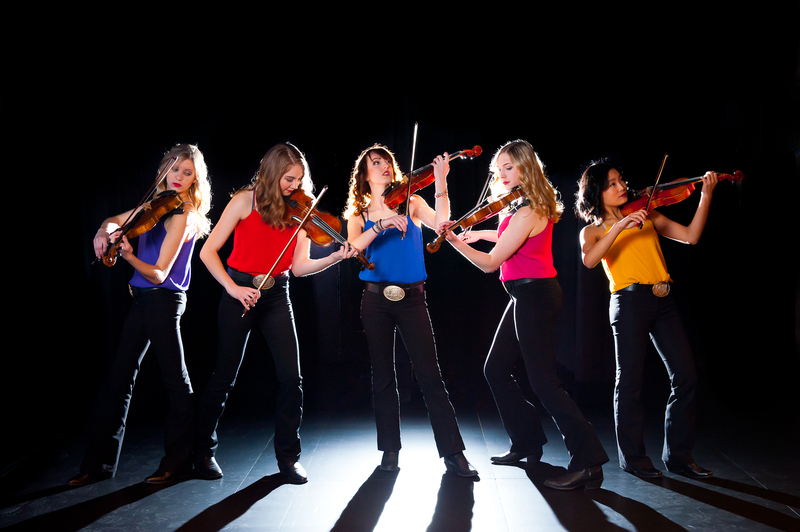 They share toe-tapping fiddle culture and music with all ages in schools, seniors facilities, emergency shelters, conventions, malls and are ambassadors for Calgary, Alberta and Canada wherever they go. Despite the downturn during our latter fiscal year performance opportunities remaining steady. 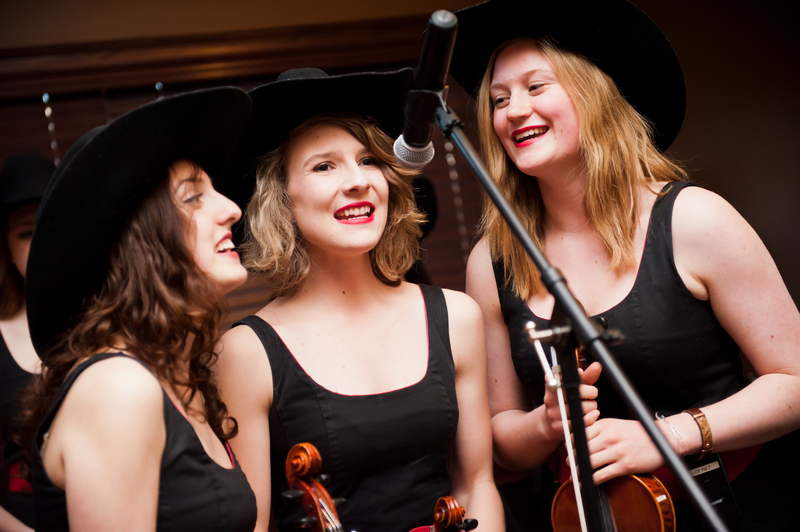 The Calgary Fiddlers were invited to perform at more conferences and conventions in Banff and Lake Louise which allowed us to have solid revenue. Additionally, we had a regular contract with Tauck Tours International for opportunities to perform at Heritage Park for their tourists approximately 20 times during the summer months. * Bow Valley Fiddlers is large as it accepts fiddle students (ages 6-18) who want to learn to fiddle and do some performing throughout the year. 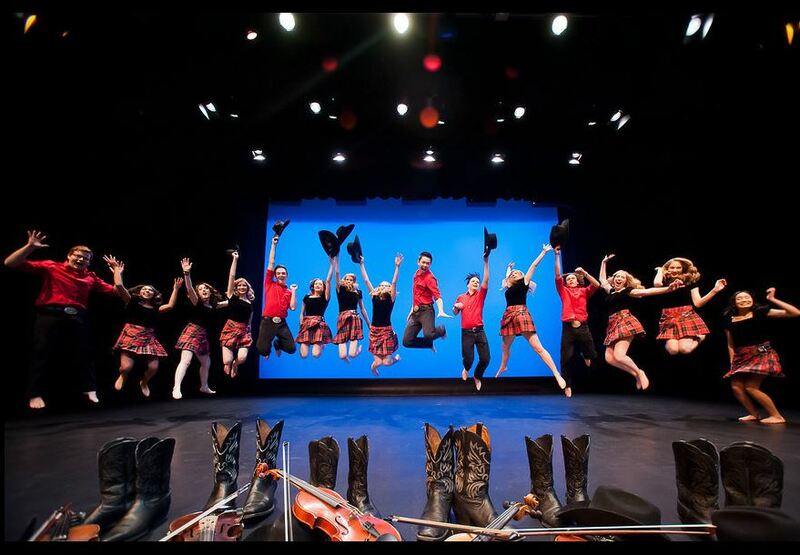 Once our students turn 13 there is the option to audition for the Calgary Fiddlers. 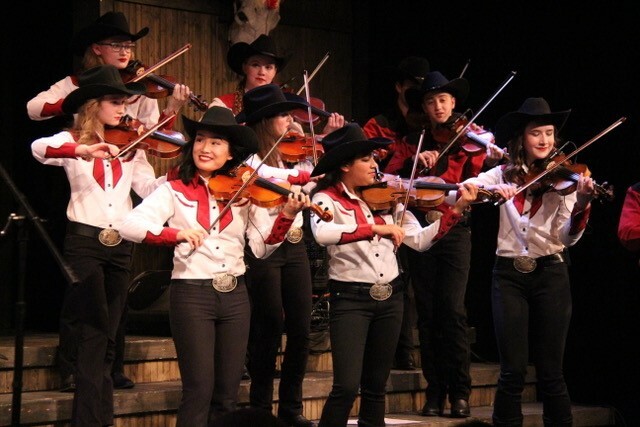 The Calgary Fiddlers is a HUGE commitment, so if students have other activities and just want to fiddle for fun while skiing, playing hockey, etc…they just continue on in our in our highest level Bow Valley Fiddlers group. Our educational program offers young classical violin students of varying abilities new opportunitities to learn various styles of fiddling, and are also given opportunities to perform in the Calgary and area communities. Like many Canadians, we were moved by the hardship, heartbreak and chaos affecting the displaced Fort McMurray individuals and families. In May 2016, we hosted a free benefit concert “Fiddles for Food” to raise money for those affected by this tremendous wildfire. We offer opportunities for over 150 volunteers each year who wish to participate in our events and give back to the community. 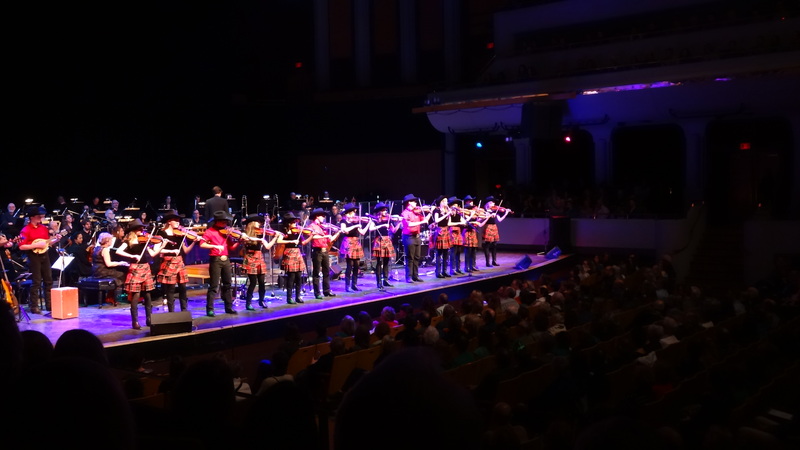 Since the formation of The Calgary Fiddlers in 1981, this highly skilled group of amateur musicians, ranging from 14 to 18 years of age, has performed for live audiences, television and radio broadcasts, and concert tours. Over the years, the group has toured extensively throughout such places as Spain, France, Scotland & Ireland, West Virginia, Pennsylvania, Florida, Kansas, Iowa, Montana,Wyoming, Minnesota and Hawaii. They were chosen as ambassadors of Alberta for centennial celebrations in Ottawa, where they performed with the National Art Centre Orchestra in May 2005. They have been sent by the Alberta and Canadian Governments as ambassadors to Korea, Los Angeles, Monte Carlo and Monaco, and New York City. The Fiddlers have also had the privilege of performing for dignitaries such as H.S.H. Prince Albert of Monaco,former Prime Minister Jean Chrétien, Prime Minister Stephen Harper, the President of Yemen and His Holiness the fourteenth Dali Lama. Recent notable appearances include the opening of the “Live with Kelly” show in Banff, AB and a feature spot on the Australia TODAY show, filmed in Lake Louise. 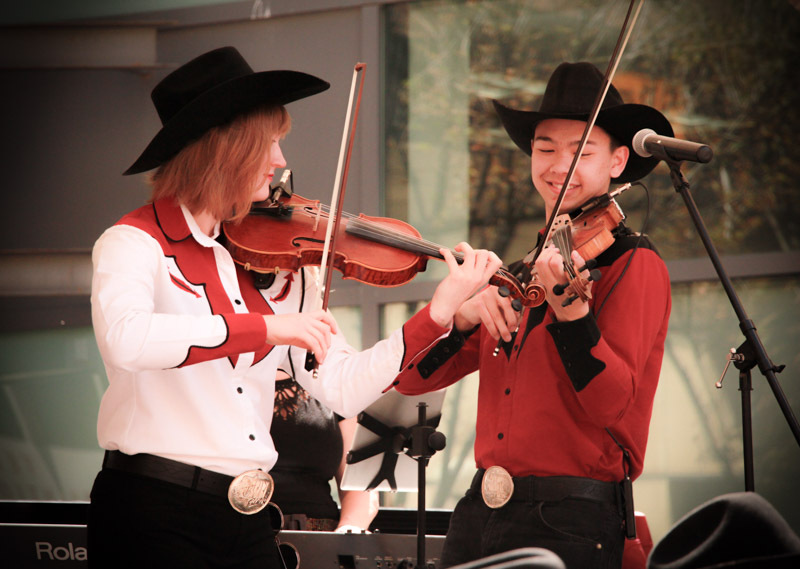 The Bow Valley Fiddlers, created in 1995, is a division of The Calgary Fiddlers Association and although they are separate and distinct from The Calgary Fiddlers division, both groups fall under the same association. 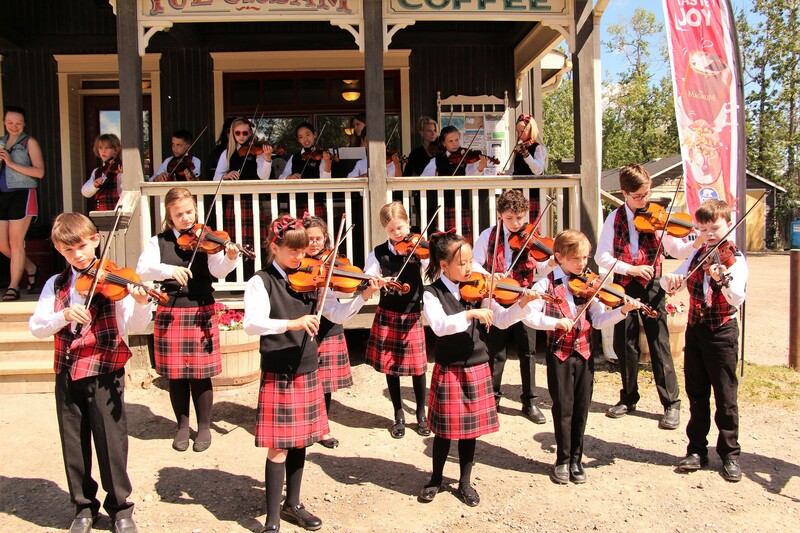 Bow Valley Fiddlers (ages 13-18 years of age) aspiring to dedicate more time to fiddling and performing; many audition to be members of the The Calgary Fiddlers. 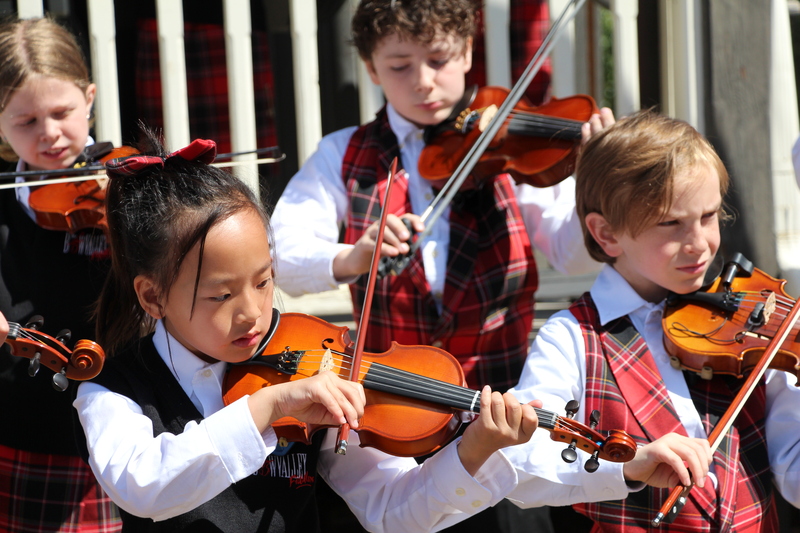 To see these fiddlers at the Calgary International Children’s Festival, click here. Our Programs. How do we do it? There are currently a total of 5 fiddle groups that meet weekly to learn fiddle tunes and accompanying choreography. Fiddling in an ensemble setting emphasizes listening skills, timing and teamwork. Each fiddle student meets with fiddle instructors for several one-on-one coaching sessions each semester to learn the bowing techniques and timing unique to the fiddle genre. Intensive fiddle workshop weekends are offered to fiddle students twice per year. Clinicians are brought in to work with our students on dancing, choreography, public speaking, percussion and fiddling. On occasion. there are opportunities for our students to work with fiddle great such as Natalie MacMaster, Gordon Stobbe, Daniel Gervais and Ben Plotnick. 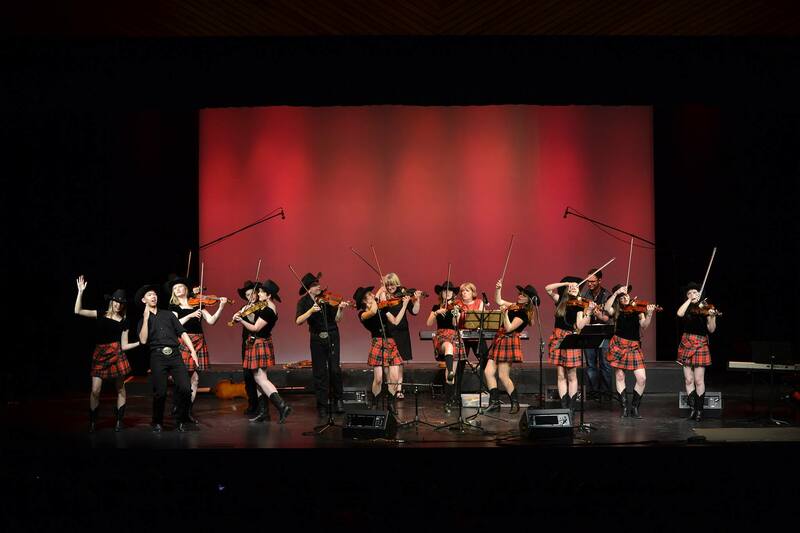 Each year, our fiddlers have opportunities to perform either provincially, nationally and internationally. We feel touring is an integral addition to our programming. It allows our students to perform several full shows in culturally unique communities and countries. This opens their eyes to how others live, and to view the world in a musical context. The people and youth they meet on these tours also helps them to forge life-long relationships. 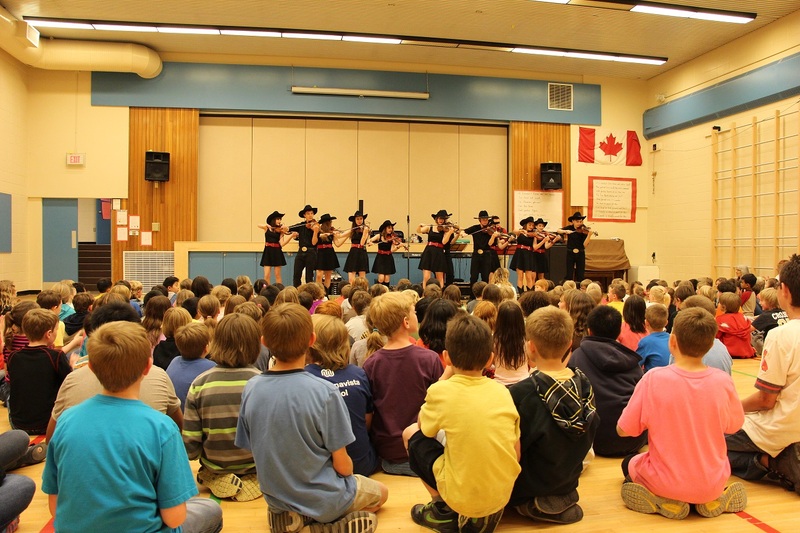 In 2016, the Calgary Fiddlers Association implemented a unique outreach program to help meet the emotional needs of the community. These specialized performances are designed to improve mood and mobility, relieve anxiety, stress and depression, and enhance concentration and creativity through live interactive shows. Those living in seniors’ facilities, hospitals, hospices and temporary living facilities such as Inn From the Cold, and organizations empowering youth with disabilities are the greatest beneficiaries. In 2012, as part of our 30th Anniversary year, the Association began the Spread Fiddle Music initiative. The primary goal of this initiative is to share fiddle music (and the love of music, in general) within school settings, and to inspire young students to take up a musical instrument of any kind. 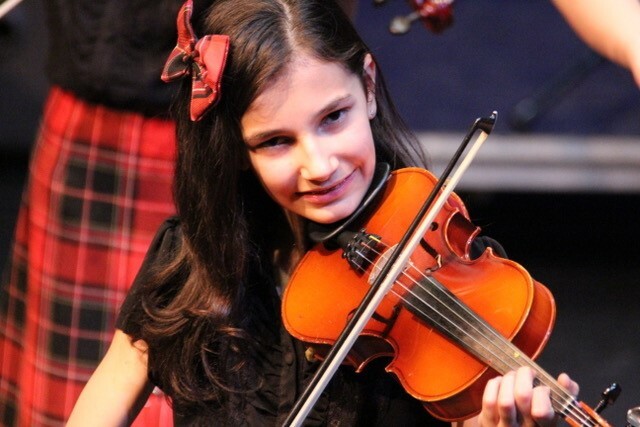 We also focus on the many diverse fiddle genres, and provide interactive opportunities for students to play the spoons, shakers, learn some traditional fiddle dances and to hold a violin. 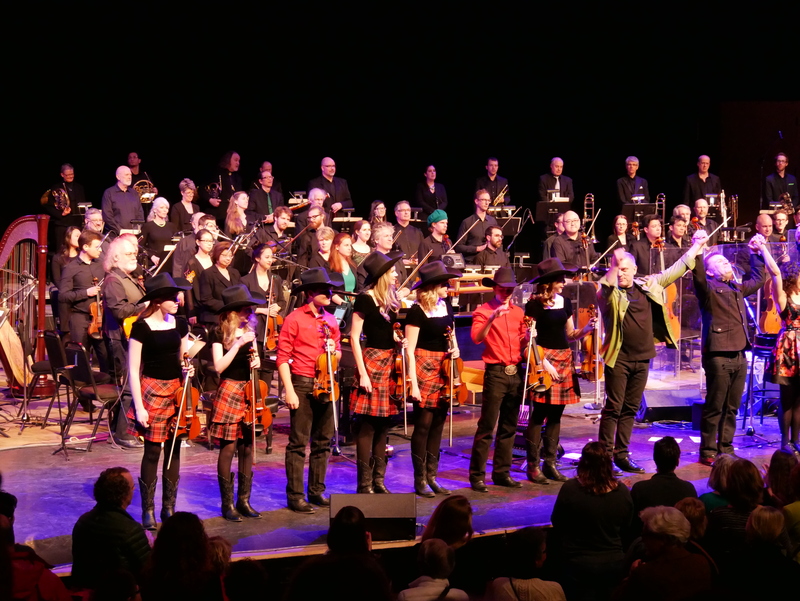 The Calgary Fiddlers Association is always seeking sponsors, donors and in-kind contributions to help stretch our budget. 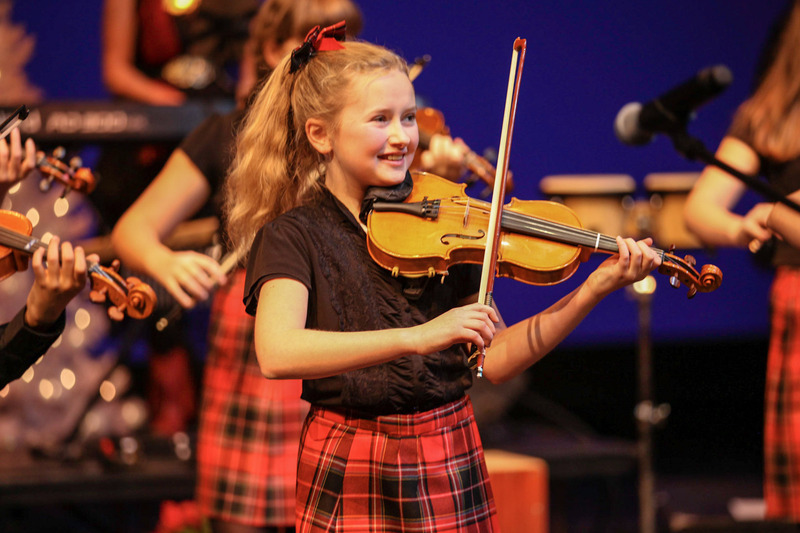 $550-$2000 can help one of students pay for a whole year of fiddle programming (group rehearsals, one-on-one coaching, 2 fiddle camps, costumes and photo keepsake). Each year, we have students whose families are unable to meet the financial commitment of being in our program due to job loss, illness, work-related accidents and family separation/divorce. 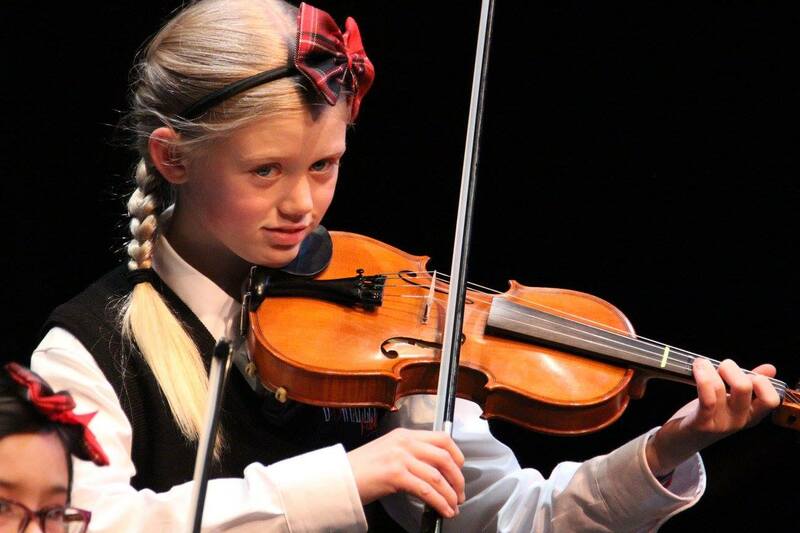 Your donation can help to make a child’s dream to fiddle, come true! New arrangements – $1000 helps hire professionals to create one new fiddle tune yearly. Uniform expenses – $2500 helps make new outfits and maintain older ones each year. Guest clinicians – $3000 can help us to bring in several guest clinicians each year. Concert venue rentals – $5,400 can help us to rent concert venues for one year. Vehicle costs – $10,000 can help with all vehicle costs each year. Vehicle costs – $11,000 can help pay off our gear van loan. Rehearsal space rental – $11,025 can help us to rent rehearsal space for one year. Sound gear upgrades – $20,500 can help us to upgrade our old sound gear. Teaching costs – $60,000 helps pay for rehearsals and individual teaching for a full year. ​Event/Program Sponsorships: For as little as $1000, you could help sponsor a concert or special event. Volunteers: Each year we need more than 100 volunteers who dedicate approximately 1,500 hours of time each year to help with events and workshops. Volunteers are essential to our operation. With hundreds of performances each year, we couldn’t succeed without you! Board Members: We are always accepting applications from individuals passionate about youth, music and the arts. Our board members bring legal, fundraising, marketing, business and financial strengths to the table and are dedicated to finding new sources of funding for our organziation. 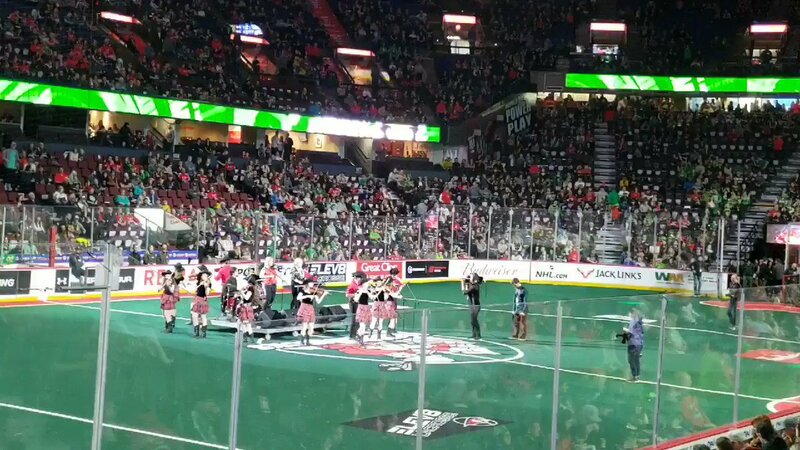 Our members also ensure strong governance so we may continue to make strong contributions to youth music development and to the local arts community as a whole.
.@CalgaryFiddlers playing halftime @NLLRoughnecks game. @HeatherRankinMe @CalgaryPhil @CaseyOLoughlin We are so excited to be performing with you, tomorrow!